As we are becoming the more technological dependent, we are producing more and more E-Waste Recycling in Delhi. These are polluting the environment because we are not careful about it. We offer E-Waste recycling Bangalore, Mumbai, Pune, Kolkata, Chennai, Hyderabad, Visakhapatnam etc. 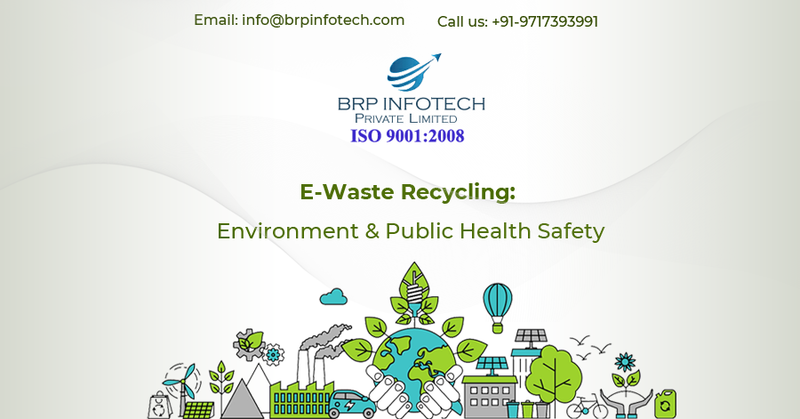 BRP Infotech is a well equipped e-waste recycling company in Delhi which helps a lot in tackling with the problem of e-waste. E-Waste Recycling in Kolkata provides various services for the proper reuse and recycle of e-waste. E-Waste Recycling in Mumbai is taken seriously and many companies are working in this area. Our main focus is on recycling old electronics like TV, computer, washing machines, mobiles, cables, printer, scanner, fax machines, VCRs, and DVD players etc. that are not in use, to make our environment clean & safe. Our E-Waste Recycling in Pune Center provides electronic waste solutions to all your e-waste products. We also provide guidance and information to consumers how to recycle their electronic waste. If E-Waste is not managed properly, it will create disasters and cause very dangerous effects on human beings, plants and animals life. So proper recycling of e-waste is must. Through our E-Waste Recycling Center , we request you no to dump your old electronic waste in garbage as it has hazardous effects. An authorized E-Waste Recycling Unit in Chennai for safe disposal of electronic scrap, managed by a group of professionals, the team has all the expertise necessary for e-waste management and disposal in a globally acceptable manner. The problem of e-waste in the country is increasing and Hyderabad is the sixth largest generator of e-waste in India. To encourage proper E-Waste Recycling in Hyderabad, the Telangana government has announced the e-waste management policy. At our E-Waste Recycling in Delhi, we accept electronic waste such as discarded computers, office electronic equipment, mobile phones, television sets, refrigerator etc. which are handled for reuse, recycling or disposal. Our E-Waste Recycling Center in Visakhapatnam offers environmentally responsible IT asset recovery and e-waste recycling services to organizations in Visakhapatnam and surrounding areas. Now a day e- waste is big problem in India so don’t concerned about data destruction and removal. BRP Infotech Pvt. Ltd is best service provider of data destruction and removal on your devices and electronics waste. Find the professionals platform of data destruction and removal which is no longer need. EPR Implementation brings a huge change in business functioning, especially in the company who is trying the software for the first time. BRP Infotech is providing good solutions of EPR Implementation.